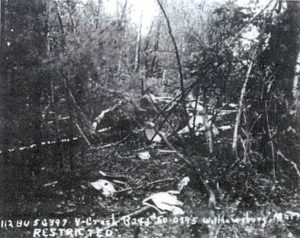 In the early morning hours of September 17, 1944, what was described as a “heavy bomber”, possibly a B-24 Liberator, was on a night training flight when it crashed into a thickly wooded area in Granby, Massachusetts, about two miles north of Westover Air Field. The aircraft broke apart on impact and wreckage was reportedly scattered for hundreds of feet. The area where the crash occurred was on a farm off East Street. 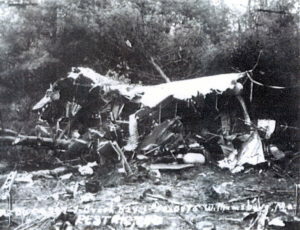 All seven crewmen aboard the aircraft perished in the accident. Pilot: 2nd Lt. Gene Revere Asay, 28, of Lodi, Colorado. Co-pilot: 2nd Lt. John W. Woodrow, 22, of Huntington, Indiana. Flight Engineer: Sgt. Neal W. Johnson, 22, of Ashland, Kansas. Asst. Flt. Engineer: Pfc. Jack W. Hariston, 18, of Atlanta, Georgia. Radio Operator: Cpl. John A. Perry, 21, of Warwick, R.I.
Asst. Radio Operator: Pfc. Clifford K. Nordby, 18, of Walhalla, North Dakota. Air Gunner: Sgt. William Donald Haynes, 26, of Parsons, Kansas. 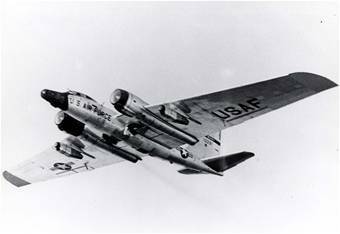 The men were assigned to the 112th AAF Base Unit at Westover Field. 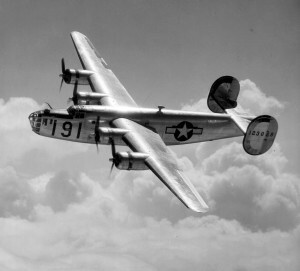 On the morning of May 1, 1945, a flight of U. S. Army B-24 Liberator aircraft left Westover Field Air Base in Chicopee, Massachusetts, for a combat formation training flight. 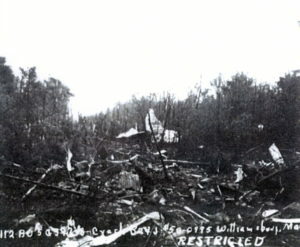 Briefing for the flight had been held at 3:00 a.m. during which the pilots had been told that there would be a low cloud overcast covering the area, but that it was expected to clear. 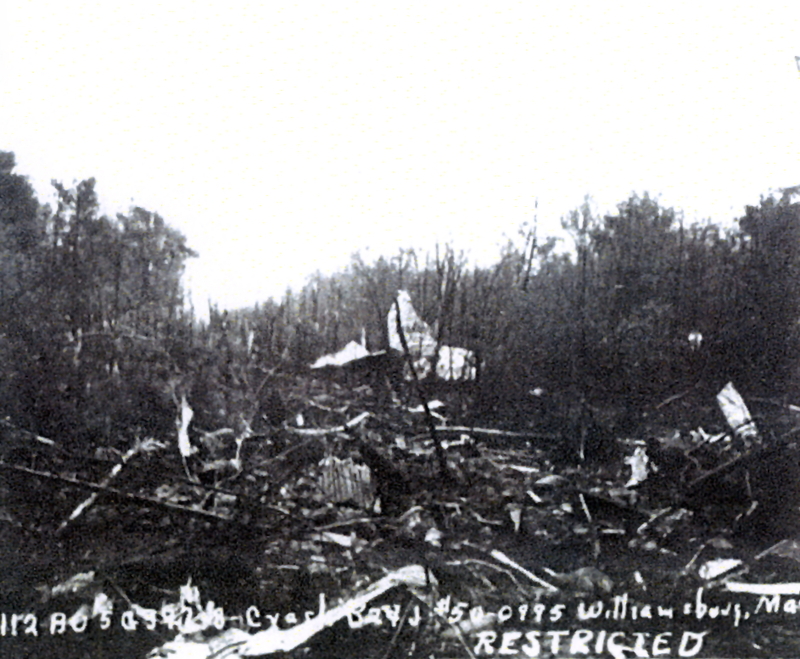 However, after the flight was airborne for nearly two hours, instead of improving, weather conditions had continued to deteriorate, and the overcast gradually extended lower and lower to the ground. Shortly before 8:30 a.m., one aircraft, a B-24J, (Ser. No. 42-50995), began to drop down through the overcast, which by now extended nearly to the ground. The crew however, was unaware of this. The pilots watched the altimeter closely. It was reading 1,500 feet when they suddenly broke through the mist and found themselves at tree-top level over the town of Williamsburg, Massachusetts. The pilots attempted to climb and gave the engines full throttle but it wasn’t enough. The plane barely missed a private home before it began clipping tree-tops for a third of a mile and then crashed into a wooded area of second-growth trees off Briar Hill Road. 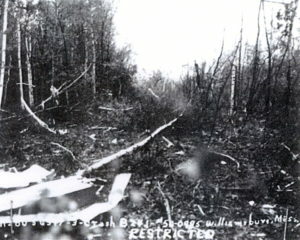 The B-24 plowed several hundred feet though the woods knocking down trees and smashing through stone walls, breaking apart in the process. Although its fuel tanks held high-octane aviation fuel, there was no fire which saved the lives of crew members trapped in the wreckage. 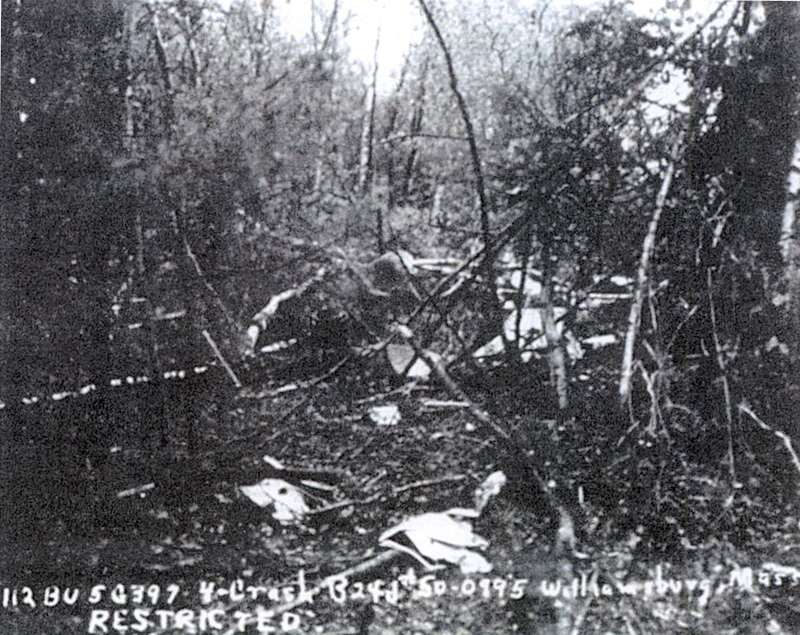 Two of the crew were killed instantly in the crash, a third died two days later. The other seven suffered serious injuries. Only the co-pilot was able to extricate himself form the wreckage. Among the first to reach the scene were some local residents including Doctor Ruth V. Hemenway, and a group of wood cutters who had been working nearby. Fire and rescue crews from Williamsburg, Northampton, and Westover Field, as well as state and local police, also arrived to help. It reportedly took rescuers more than an hour to free those trapped in the wreckage. The injured were transported Cooley Dickinson Hospital in Northampton. (Nose Gunner) Corporal Kenneth Virgil Powell, age 19, of Urbana, Ohio. (Gunner) Corporal Donald R. McKenzie, of Spokane, Washington. Cpl. McKenzie was survived by his wife and daughter. (Gunner) Corporal Joseph Skwara, of Latrobe, Pennsylvania. Cpl. Skwara survived the initial crash, but later succumbed to his injuries. The following images of the crash scene are from the U.S. Air Force investigation report. 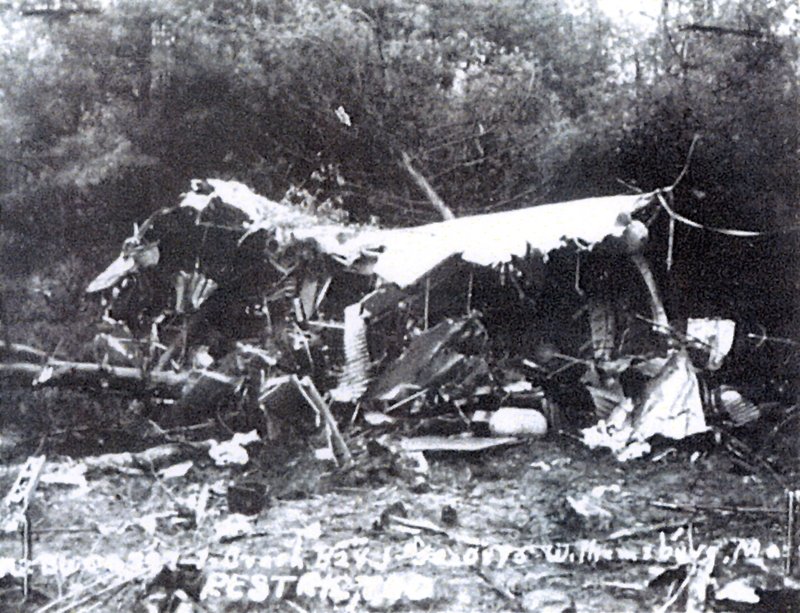 Air Force photo from crash report. 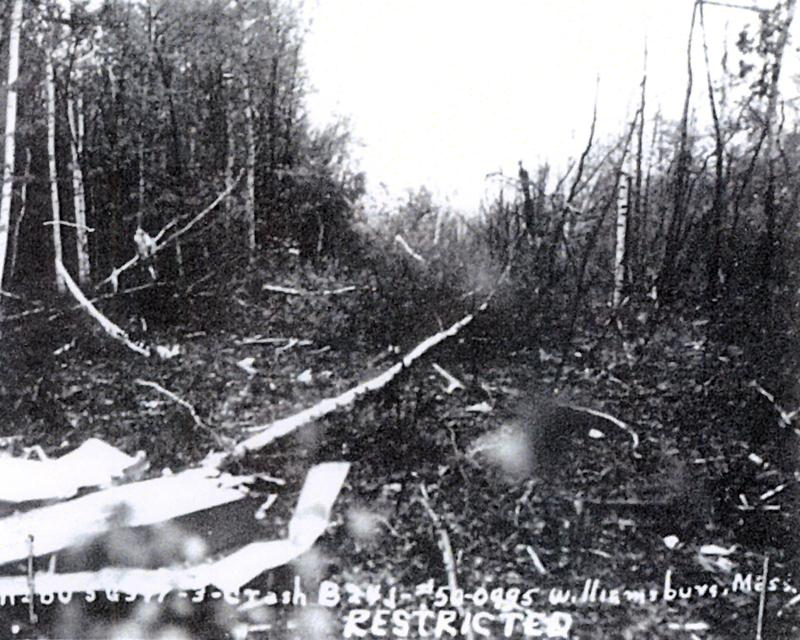 Research Paper, “Burgy Plane Crash, Briar Hill, 1945”, by Ralmon Jon Black, Williamsburg Historical Society, 2012. Includes articles from the Springfield Union News, and Daily Hampshire Gazette, and other information about the accident. Obituary for Cpl. Donald McKenzie, Spokane Daily Chronicle, May 5, 1945, page 6.